I've been doing quite a lot of that. :-) I'll have to see what I can come up with. Thanks! great plugin. Not related to the Full Vs. Partial feed debate, but is there a way to make your plugin work if WP is set to provide partial feeds? I don't want to truncate my feed but I would like to edit the links within the feed and make them point to the specific posts. Is there any way to do that? Viper's Video Quicktags plugin does something like that when there is a video embedded which is not viewable in the feed, it then displays a link which says "Click here to watch the video on the original site" or something like that. I've created a new RSS feed with this guide (http://xplus3.net/2008/10/30/custom-feeds-in-wordpress/) but I can't figure out how to bypass the Better Feed from this new feed. Does this plugin work with WP 3.1? Brian Clifton » works fine here. Thank you very much from France. i really need it ! Thank you for this plugin, is there a way to add the thumbnail image to the feed? i have problem, when i use read more tag in my posts. my feed not show in full text and cuted with read more tag. i want my feed show full text in feed readers. i disabled cut feed options in better feed setting but no effected! Excellent website. Many valuable facts in this article. I sure am delivering it to a couple of buddies ans also revealing in delicious. And of course, great sweat! Is there an instruction page on how to get this plugin to work after it has been installed? Am I suppose to put some of the code into the body of my post? Hello, i didn't see any menu to add RSS feed with your plugin. I see only Settings/Better Feed. 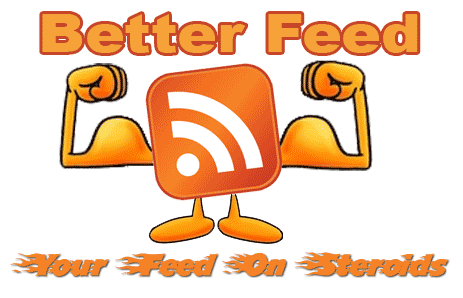 How can add a rss feed ??? Thanks to 'Tiger Weeds' above – that was going to be my question as well and your question and answer to your own comment helped immensely! Hi, I was wondering if it would be possible to creat e a custom feeds with your plugins in this specific way: I am using buddypress and want to know if I can create a feed of all custom post types from members in a particular group. If so, are there any special considerations I need to take? Thank you in ad Vance for your reply. Hi Ozh: Love this plugin – it's exactly what I needed for the feed so thanks for sharing it. However, I don't want to break up what's on my blog's homepage (which displays the most current full post) with the tag. Is there a way to flag "more" for the feed only, but not on the post's home page display itself? Is there any way to hide the BetterFeed imposed Feed Item Footer in excerpts only? I want it to show on full posts in the feed but not the excerpts. Is there a way to do this within the plugin or would I have to use scripting? I am a fairly new blog and once my traffic increases I will remove it but I really want to add the "read more" after 100 words. How and where do I add that? I know I add this code but where do I add it and how do I let it determine the number of words its shows before the "read more"? This plugin seems to be the best. But i don't have the same screen you have in your article. I don't have the preview you have in your article. Is this plugin compatible with the last version of WordPress ? Can you give the code of the Tokens to help people who have problem with the plugin like me ? Jerome » Indeed, the live preview doesn't seem to work any more, don't know when it stopped working. I don't plan on updating this anyway. the features very helpfull with my site. I really love this plugin but I wonder: is it possible to enable this plugin for the comments-feed, too? I know a little PHP myself so if you gave me a hint on how to do that I might try to do that and provide you with an updated version. Great plugin. But does not display the image of the post in the feed. How can I post a picture in the feed?